Sean Meaney was speaking at the unveiling of CueCommerce – an ecommerce development, integration and marketing solution to help the retail sector in Laois make the shift from ‘bricks to clicks’. 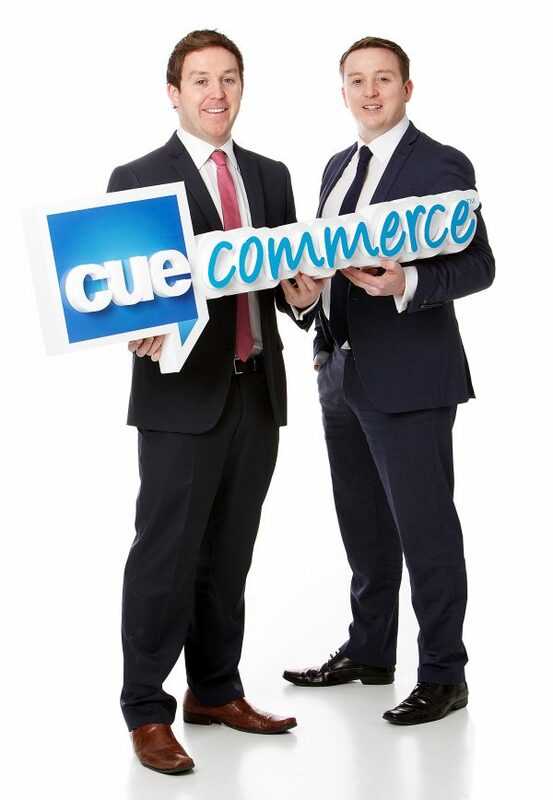 Brothers Sean (left) and Kevin Meaney (right) at the launch of CueCommerce - an integrated ecommerce solution driving online marketing and sales for the retail sector. well for a sector working hard to drive growth, but how can the retail sector maximise these new opportunities? Meanwhile, for the online shopper, the journey from apathetic browser to happy hunter is a seamless one. CueCommerce was the brainchild of brothers Kevin and Sean Meaney of IDF Marketing – the parent company. They employ 17 people in their Limerick, Dublin and UK offices. However, employment is set to double by 2015 with the introduction of CueCommerce. The brothers bring specific competencies to the business. Sean is a Masters in Marketing graduate from Smurfit Business School while Kevin’s knowledge of new media is an integral part of ongoing R&D activities. Kevin holds a Masters in Interactive Multimedia from the University of Limerick. Their clients include The Body Shop, McCabe’s Pharmacy and Smurfit Kappa. Kevin Meaney founder of IDF Marketing says, CueCommerce’s CPA (Cost Per Acquisition) is a new marketing tool which offers added value to the online retailer. “It’s basically a no-risk marketing partnership for retailers whereby CueCommerce gets paid a percentage of online sales which we deliver through the clients ecommerce website. So no sales, no cost. Asked what future trends they see evolving in digital for the retail sector Kevin Meaney says he has 5 predictions for ecommerce in 2013. Loyal Customers, Returning Visitors: The traditional loyalty programme for air travellers has now been transported to retail. Businesses across industries are developing customer incentives and integrating permission-based data into comprehensive customer profiles to offer the next level of personalisation and service. Mobilisation of the Flock: As consumers adapt to living their lives from their mobile phones and tablets, they’ll expect platform-specific offerings that give a better shopping experience, geo-specific content, special offers and other elements that complement and enhance life on-the-go. It’s Got to Look Great: A website that’s designed for optimal viewing, no matter which mobile or tablet device is being used, is the new norm. Modern consumers will not accept non mobile-enabled sites. Cross Channel Selling: Consumers don’t think in channels. Rather, they think in brands. So a completely seamless e-commerce experience no matter where they are – at their desktops, on their smart phones and tablets, or on social media is paramount. Social Media Phase II: For far too long, marketers have treated social media as an island from the rest of their strategy, and, in turn, have not reaped any benefits of it as useful sales tool. Going forward, we’ll see more brands using social data to personalise experiences on their websites, as well as applying testing and personalisation to their own Facebook pages. CueCommerce takes to the road in the coming weeks to showcase their new product and test it on the retail sector across Ireland.